Easy Lunch Boxes Uncensored | Lucky Taste Buds! 1. 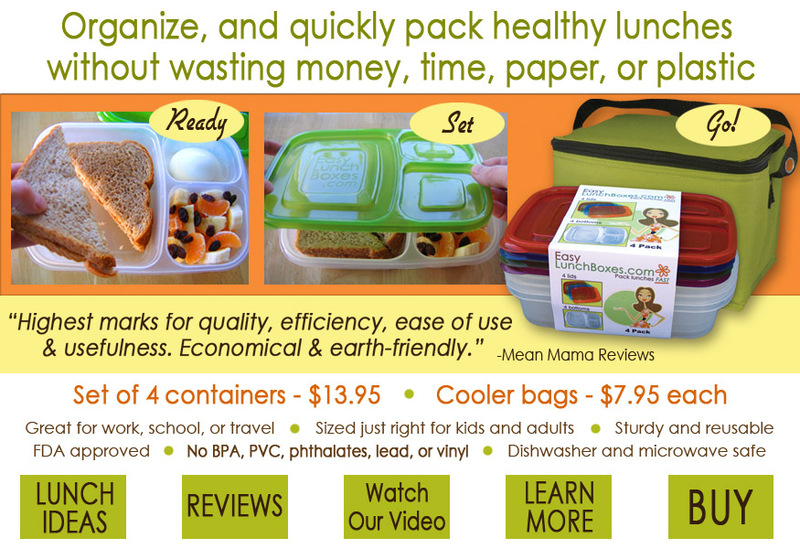 The Lunch Boxes are more sturdy and durable than your average plastic Tupperware. It is made out the highest grade plastic polypropelene plastic (#5) a thick, PBA-free plastic that will hold up very well to rough journeys to work or school. 2. Safety safety safety!! Easy Lunch Boxes have ensured that all the materials used in their containers and bags are food and child safe and even pass strict FDA requirements! Easylunchbox products contain NO Lead, Vinyl, PVC, Phthalates, or Bisphenol A (BPA)!! 3. Microwave Safe. 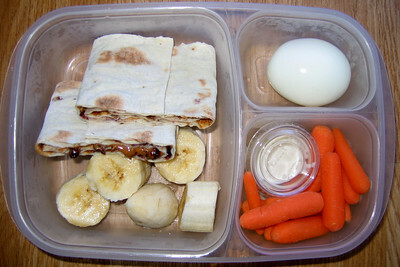 Easy Lunch boxes are FDA-approved for microwave usage. The plastic that does not leach any BPA or Phthalates when heated or cooled. 4. Lots of Colors. Lunch is way cooler when you have 4 colors of Tupperware lids to pick amongst. If you buy a cooler bag, you’ll also have multiple colors to pick from! 5. Portion-controlled and Size-appropriate. 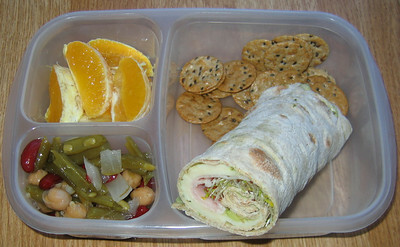 The well-sized Tupperware allows you to pack a lunch that is more nutritiously dense and filling. There’s enough room to pack your sandwich and 2 sides. Check this out! No more sandwich bags for your extras!! 6. Bento/Compartmenting concept! 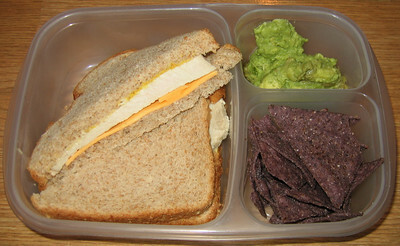 I love the fact that I don’t have to just pack sandwiches. Sometimes, I like bringing stir fry with a side of rice or beans or meatballs, but I don’t want it to turn into one giant bowl of jumbled mess. The separate compartments really allow your food to appear as elegant as when you first packed it. 7. Get creative in the kitchen!! See the picture below? Homemade guacamoleeee! I found that you can’t pack anything that resembles liquid or else…it will leak. The seals are not made to snap all around the container, so I would recommend solid foods, no sauces or soups. I haven’t been able to replace all my Tupperwares with Easy Lunch Boxes. Sometimes, I do need a hearty thick stew for lunch or a ginormous salad, which just won’t fit. My Recommendation: these lunch boxes ARE perfect to supplement your stash of leak-proof Tupperwares. They are also great for kids and folks who like color. 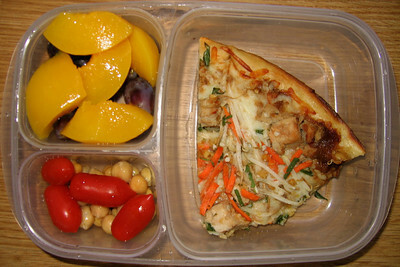 The bento concept inspires me to think out of the box when it comes to lunch packing! You definitely don’t have to always have sandwiches or wraps for lunch. Take advantage of the Jasmere.com deal, 4 entire food container sets are only $4.19!!!! That’s $1 a piece!!! Jump on it savvy bloggies!! How convenient! I wasn’t sold on it until I saw YOUR lunches in it. Your food makes them look better 🙂 I love that they are BPA free and microwavable. I’ll check ’em out. I just love these–I am a huge fan of packing my own lunch and have quite the collection of lunch boxes going on!